Temperament: Bulldogs are one of the gentlest dogs. Bulldogs are known for being affectionate and dependable dog. They are generally great with children. Bulldogs are also known for having courage and are outstanding guard dogs. Bulldogs can be stubborn, persistent dogs. Bulldogs are definitely people dogs and live to please and seek attention. Family Dog: Bulldogs make great family pets. Shedding: Bulldogs are considered average shedders. Grooming: Bulldogs are easy to groom. Bulldogs should be brushed with a firm bristle brush. Bulldogs need to have their face washed daily with a damp cloth. Special attention needs to be taken to clean under the folds in their skin. Bulldogs should be bathed only when necessary. Weather: Bulldogs are very susceptible to heat stroke in warm weather. Care should be taken to keep them cool in the summer or warm climates. Never leave your Bulldog outside for long periods of time in hot weather or in a hot car. Bulldogs are also very sensitive to cold temperatures. Bulldogs do best in moderate climates or indoors. Exercise: Bulldogs are not bid on exercise. Some Bulldogs would rather not have any exercise at all, but others may be full of energy. Bulldogs should have daily or frequent walks to keep them fit. Living Conditions: Bulldogs make great apartment or indoor dogs. Bulldogs are very active inside and do not need a yard. Appearance: Bulldogs are medium, compact, wide dogs. Bulldogs should have wide shoulders and massive heads. A Bulldogs cheeks should extend to the sides of its eyes. The Bulldog is known for its large skin with dense folds on it head. The Bulldog has a short, black, broad nose with broad nostrils. The Bulldogs lower jaw should be undershot. A Bulldogs eyes are dark, round and widely spaced. The Bulldog's ears should be small and folded back in the form of a rose. A Bulldog's tail is short and carried low. Bulldogs are known for their short stocky legs and square build which produces the Bulldog waddle they are known for. A Bulldog's appearance should portray power, stability and strength. Size: Bulldogs should be between 12 - 16 inches tall when fully grown with female Bulldogs weighing between 49 - 51 pounds and males weighing between 53 - 55 pounds. Head: The circumference of the Bulldog's skull in front of the ears should be equal to or greater than the height of the dog at the shoulders. 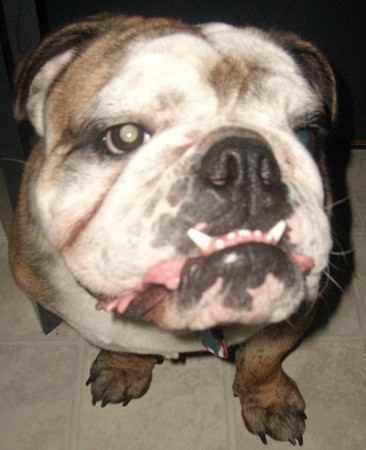 The overall appearance of the Bulldog's head should have a broad square appearance. The Bulldog's forehead should be tall and flat. The cheeks of a Bulldog should be rounded and protrude sideways and out beyond the eyes. Nose: The Bulldog's nose should be broad, large, and dark in color. The nostrils should be large with a well-defined line between them. Eyes: eyes of the Bulldog are round in shape, set far apart and very dark in color. Ears: A Bulldog's ears should be set high on its head. The Bulldog's ears should be far apart from each other and as far away from the eyes as possible. The front inner edge of a Bulldog's ear should join its skull at the top back corner of. They should be small and thin with the back lower edge folding inward and the upper front edge curving over. This gives the Bulldog's ear a rose shape. Muzzle: A Bulldog's muzzle should be short, broad and turn upward. The Bulldogs muzzle may be dark in color. The Bulldog should have massive, square, powerful jaws. The lower jaw should protrude farther than the upper jaw. A Bulldog's teeth h should be large and strong. Neck: The neck of a Bulldog should be short and thick. Body: The Bulldog should have a slight fall in their back behind the shoulders and then rise slightly again forming the arch they are known for. The Bulldog's chest should be broad and deep. The Bulldog's back should be short and very strong. Forequarters: A Bulldog's shoulders should be muscular and widespread. They should slant outward. This is where the Bulldog gets its stability and power. The Bulldog's wide set front legs should be short, straight, and muscular. Hindquarters: The Bulldog's rear legs should be muscular and longer than the front legs. The Bulldog's lower leg should be short and strong. Feet: A Bulldog's feed should be medium sized and have a compact appearance. The toes should be short and well spread apart with high knuckles and very short nails. A Bulldog's front and rear feet may be slightly turned out. Tail: The Bulldog's tail is short and can be straight or 'screwed', but should never appear curly. Color: The color of a Bulldog's coat should be uniform throughout. Bulldogs can be red brindle, brindle, solid red, fawn, pale yellow, piebald or solid white. Bulldogs should not be black. Coat: The Bulldog's coat should be short and straight with a fine texture. Life Expectancy: The average life expectancy of a bull dog is 8 years. Characteristics: Young Bulldogs, like most breeds, are full of energy and lose this energy as they grow older. Bulldogs snore very loudly and tend to drool or slobber. Health: Bulldogs have a tendency toward breathing problems because of their short nose and some also have small windpipes which contribute to their breathing difficulties. Bulldog puppies often have to be delivered by caesarian because of their large heads. Skin Health: Bulldogs are prone to skin infections. Eye Health: Bulldogs have poor eyesight. Bone Health: Bulldogs often have hip and knee problems. Litter Size: Bulldogs usually have 4 to 5 puppies in a litter. History: The Bulldog is descended from the ancient Asiatic Mastiff. The Bulldog was developed in Great Britain. The Bulldogs name refers to the look and power of this dog, which used to perform in arena combat before the practice was prohibited.